I was given a work experience placement with Marc Soubeyran in September 2015. 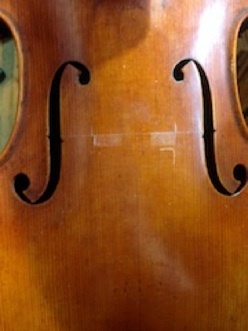 The outcome was to do a new setup on one of my instruments, either a violin/viola, over a period of 3 days. When we started work in the workshop, we first looked over the instrument as a whole in terms of making. Marc gave me a few useful tips and said I should reshape the neck, which reflects what a few players told me, and my personal opinion as well. He shared with me some things I could improve the sound of the instrument before considering the setup, such as the tail piece which was heavy rosewood and a Wittner A adjuster. We then took apart the setup after taking some detailed measurements of the bridge position and the soundpost. He explained in detail how important this can be with future customers to keep track of tonal adjustments with new setups. After analysing the setup, he then quickly discarded the old soundpost after showing me how bad the quality of the wood was. One of the main things I will practice most out of this experience is making your own soundposts from split wood on a lathe. Before starting with the soundpost, we looked at the bass bar, which dictates what bridge width you need. Then I looked through some blanks and chose a bridge according to its grain and medullary rays. Then traced the fit onto the feet and trimmed some excess wood off before starting to fit it to the arching. Leaving the bridge for now, I then started to fit the new soundpost. I first put in the old sound post to check for length, and fitted it to the correct position with the bridge. Marc then said it was a good idea to shoot the fingerboard as the radius was flat according to his template. So he showed me his method of shooting and finishing a fingerboard with mineral oils. I also polished the peg shanks as they were a bit rough looking. With all the dirty work finished, I followed Marc’s technique for how to get the string heights on the bridge without having to cut twice. Once getting the heights correct, I thicknessed with a bridge made by Marc as a guide. With that done, I started to trim the bridge trying my best to copy Marc’s style. 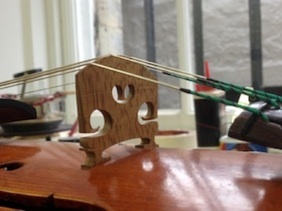 With Marc’s guidance and assistance, I managed to get a good understanding of why he shapes a bridge in this way to help spread the sound from the strings into the instrument. Marc then showed me how he finishes a bridge using propolis and burnishing the surface. 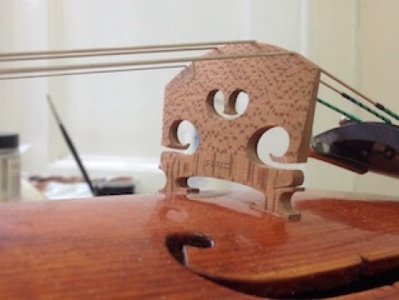 With the bridge finished, I set the viola back up and tried it. Then Marc played and I could definitely hear a difference from what it previously sounded like. I have learned many new techniques and ideas on bridge functionality and how everything works as a whole. Marc has especially helped me notice how much it matters that you have good quality wood for the bridge and soundpost. I have immensely enjoyed my time learning from him, and I hope to keep in touch in the future.